One of the nice things about working on Murray Hill in Midtown Manhattan is Park Avenue Liquors (located anti-eponymously on Madison Ave between 42-43rd ). Park Avenue Liquors (PAL) is a relatively small store, but inside is a mad jumble where the greatest spirit treasures can be found - usually jammed amongst a fantastic variety of everything else. For example, what's that just left of the Glendronach 15? It's every release of Octomore - including the first. Just to the right is the OB 9th release of Port Ellen. Behind the counter are most Scotches and Bourbons available anywhere in the City. On the back wall are heaped the world of grape spirits including monstrously priced crystal trophy Cognac bottles and century old Armagnac rarities. One of the things I love most about PAL is that spirits come first. They do sell wine - but it's clearly number two. These events are held at the end of the sales counter - jammed in tight among the narrow aisles and heaped shelves of bottles. It's a totally NY scene. 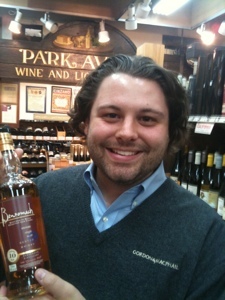 Pouring today was Chris Riesbeck, US brand ambassador for Gordon & MacPhail. He's a jovial and spirited whisky geek of high order, full of the loving specifics of G&M's excellent barrel management, the expressions, spirit markets, and lore. He was pouring G&M bottlings of Glenrothes 8, Glenturret 11, Bunnahabhain 8, and the OB 10 expression of the G&M owned Benromach. The common thread here was a period of time in Sherry hogsheads. The Glenrothes had a stunning richly floral vanilla herbal nose and an exuberant, fruity flavor - a winner at the reasonable $37 price. The Glenturret was drier, silky and rich with wooded and brooding aspect. The Bunnahabhain was subtle with dry malt and a kiss of iodine, but seemed a little thin (as Bunnahabhains often do, to me). The Benromach was, as Chris explained, a classic old style Spey in that it was fruity, lightly sherried (kissed with a stint in olorosso hogsheads) and is lightly peated. Benromach 10 comes on sweet and fruity, turns august and vinous at midpalate and the smoky whiff of peat emerges at the end as a drying and sophisticated turn at the finish. The Benromach flavor profile is extraordinary - with its far ranging tour of disparate flavor elements as each sip progresses through the palate. I wanted a bit more depth, so I'll be especially anxious to try the more mature expressions. What a lovely way to spend 15 minutes in the crushed and frenzied Manhattan hubbub!